Bring salted water to a boil in a large saucepan and take turns cooking the vegetables. First cook the carrots for 2 minutes, remove with a large spider or slotted spoon and place in a bowl. Then cook the zucchini for 30 to 40 seconds, remove with a slotted spoon and add to the bowl with the carrots. Lastly, add the nopales and cook for 10 minutes. Drain and rinse thoroughly with cold water, for at least one minute, until all viscous liquid is removed. 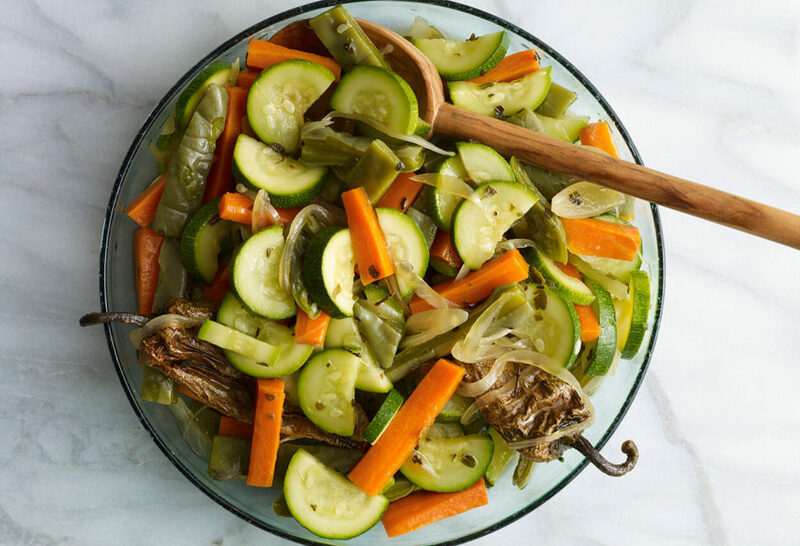 Incorporate the carrots, zucchini and nopales into the prepared chipotle pickle, toss well and scrape into a bowl or container. Let it sit and marinate for at least an hour before serving. You can also cover and refrigerate for up to 5 days. Mix well before eating. First time watching the show and I just had to try this recipe. I could not find nopalitos so substituted green beans. It was delicious both hot and cold! I can wait to try it again with nopalitos. Oh I’m glad you liked it and made it your own with the green beans! I can’t find fresh cactus paddles in Australia – would this recipe suit canned/ tinned nopalitos? Yes…just rinse and drain well, and take into consideration that they will be ready much faster than if they were fresh. I thing you need to be more specific on what “cleaning” the cactus paddle means.